You are currently browsing the archive for the California category. When you go out for a ride at Alisal, there’s not a lot of yacking. Once you’re out on the trail, people seem to settle in and keep their mouths shut. Sort of like going in to a church. Talk just isn’t necessary. So today I’m going to let the pictures do the talking. 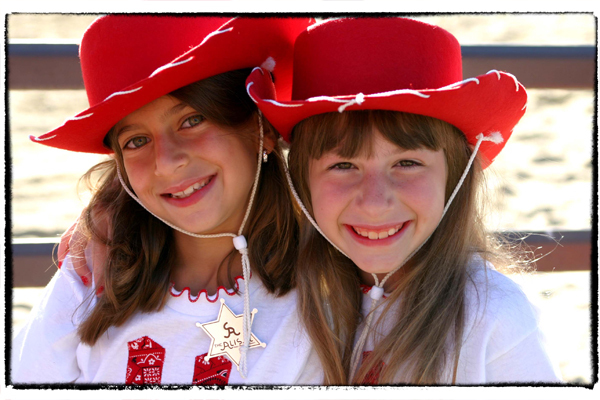 I’ve focused primarily on the cowgirls at Alisal—both the professional ones and the young ones just starting out. Just look at the photos—I think that’s all you need to know. 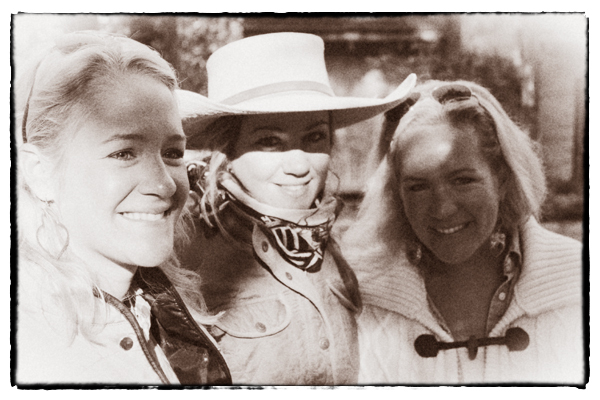 The Firestone sisters, Mary and Lucy (or maybe it’s Lucy and Mary), with my favorite lady wrangler, Haddie Tal. Photo by David Lansing. At the Waggin’ Tongue Lounge at Alisal I met Lucy and Mary Firestone. They noticed me rudely staring at them and so turned around on their bar stools and introduced themselves. Very civilized. The reason I was staring at them, in addition to the fact that they were obviously very attractive, is that I was trying to figure out if they were twins or not. They looked remarkably similar and yet, there was something about them that suggested otherwise. Finally I just asked them. That was reassuring. At least I’m not the only one who thinks so. Confession: I don’t know what a foam party is and I’ve never heard of Mojaca. About their childhood bedrooms: “Mary’s room was perfection in pink. Adorned with collages made from high fashion magazines, designer and vintage clothes strewen about, Mary’s room was a shrine to Hollywood Glamour Queens. Stacked beside her bed were cherished biographies of Marilyn Monroe, Katherine Hepburn, and other divas of the silver screen. Extraordinary. I don’t think I’ve ever read a blog where people included scenes from their childhood bedrooms as part of their bio. But there they are. The Firestone sisters. In my bungalow at the Alisal Ranch. Photo by David Lansing. I’ve become quite fond of my bungalow at the Alisal Ranch. I like its quirkiness. For instance, there’s no TV but there is wi-fi. No phone but a very nice coffee maker. I’ve got a wood-burning fireplace and every morning an elderly gentleman comes by and asks me if I need a few more pieces of oak. 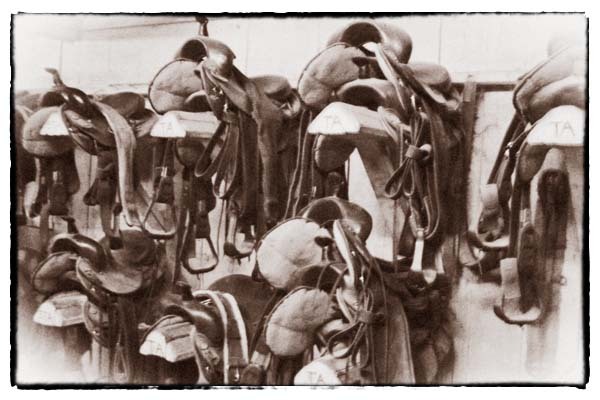 The walls are decorated with poster-sized black and white photos of the cattle operation on the ranch in what looks like the 1950s, and next to the fireplace is a rusty corrugated tin painting of a cowboy on a bucking horse. This morning, after a breakfast of coffee and huevos rancheros, I took the complimentary Wall Street Journal and went and sat in a plush outdoor chair set up under the shade of a hundred-year-old oak out on the lawn. 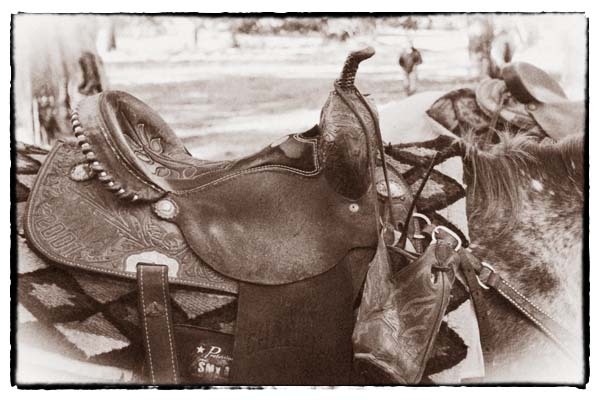 Guests in their cowboy boots and Western hats filed by, giving me a “Howdy,” on their way to the barn while I sat sipping my coffee and reading about the financial struggles in Greece–every bit the epitome of an urban cowboy. 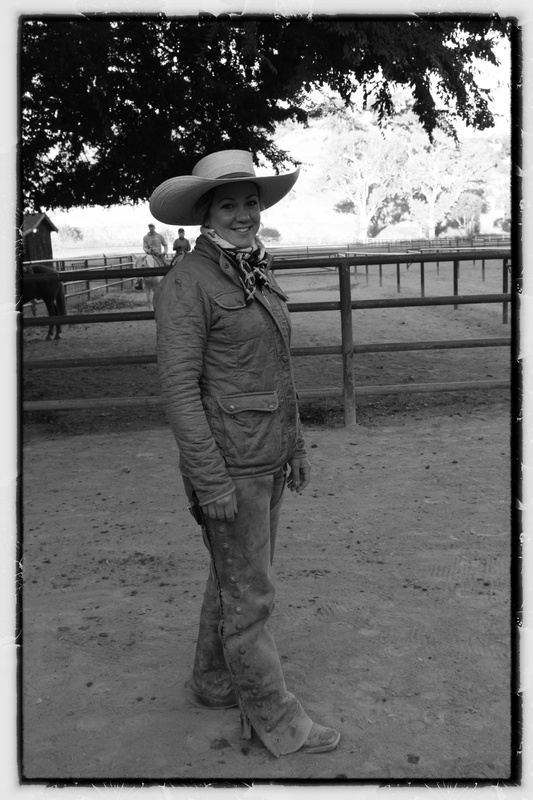 Miss Haddie Stella Tal, a wrangler at Alisal. Photo by David Lansing. Haddie has been working as a wrangler at Alisal for four years. 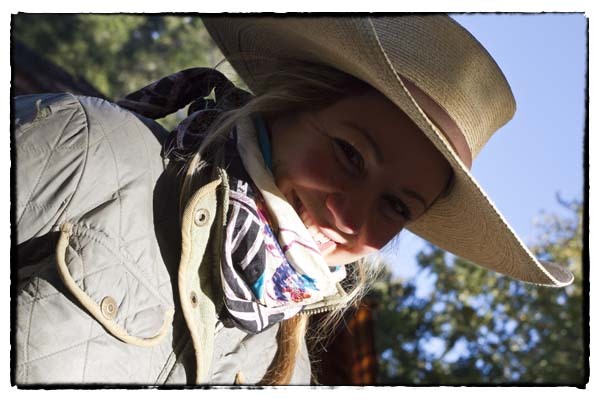 Before that she was a wrangler with an operation in New Mexico and before that she worked as a packer and back-country cook for an outfit in the Sierras. As Haddie says, “I’ve been doing this kind of work my whole life.” Yet she is only 27. Very practical advice for any woman thinking about wedding plans, I’d say. I asked her what that meant–being softer with the horses. “Our voices are softer, our manners gentler. I guess you could say we pay attention to the details more than the guys.” Not that she thinks there’s anything wrong with her male counterparts. “They’re the best in the industry,” she says. 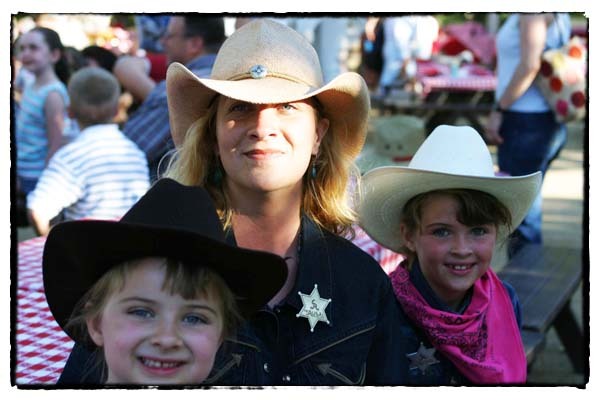 Still, she thinks the female wranglers might just be more suited to the job–at least here at Alisal. Having spent the morning riding with Haddie, I’d have to agree. I’m not sure what that is. Jeans and a clean shirt, perhaps? 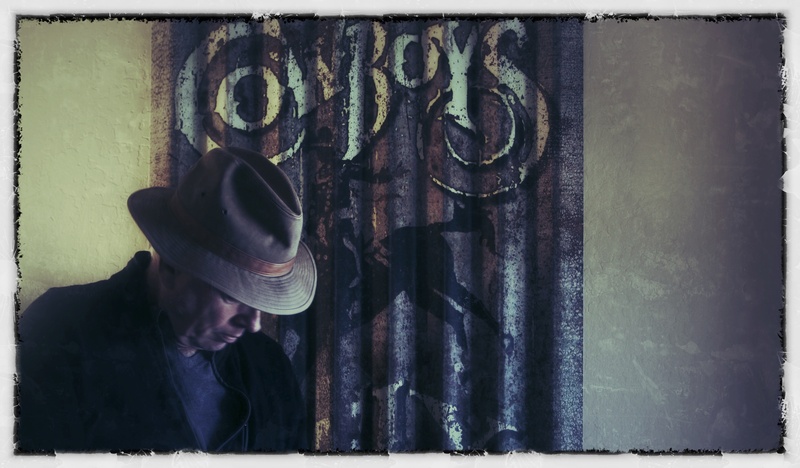 Since I don’t own any boots or cowboy hats it better not be any more complicated than that. Wednesday morning, I’m getting up early to go on a breakfast ride to the Old Adobe. 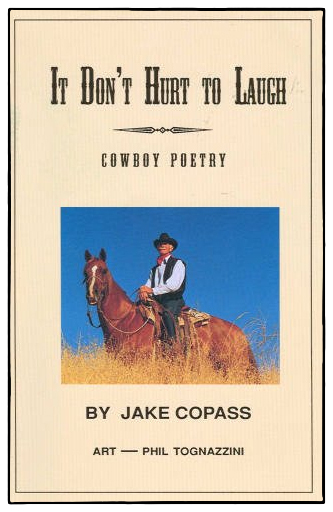 I wrote about this recently; how I was assigned an uncooperative nag who refused to budge so I ended up riding in an old pick-up with Jake Copass, Alisal’s in-house cowboy poet and long-time wrangler who passed away in 2006. Jake and I had a good chat that day. It was because of Jake, and our little talk, that I ended up going to Arizona Cowboy College. 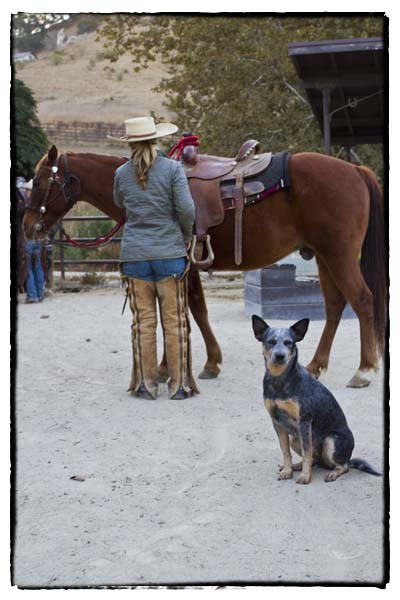 And it’s because of Jake that, for better or worse, I’ll be getting back on a horse to get myself out to the Western breakfast at the old adobe Wednesday morning. Anyway, in honor of Jake, I thought I’d reprint a poem he wrote over 20 years ago, called It’s Always Home, that was published in his book of cowboy poetry, It Don’t Hurt to Laugh. My sisters, my brothers, and me. Where the old home used to be. The windmill and the old corral. In the brush, there is still a dim trail. Perched high in that old apple tree. On our folk’s little sandy-land place.